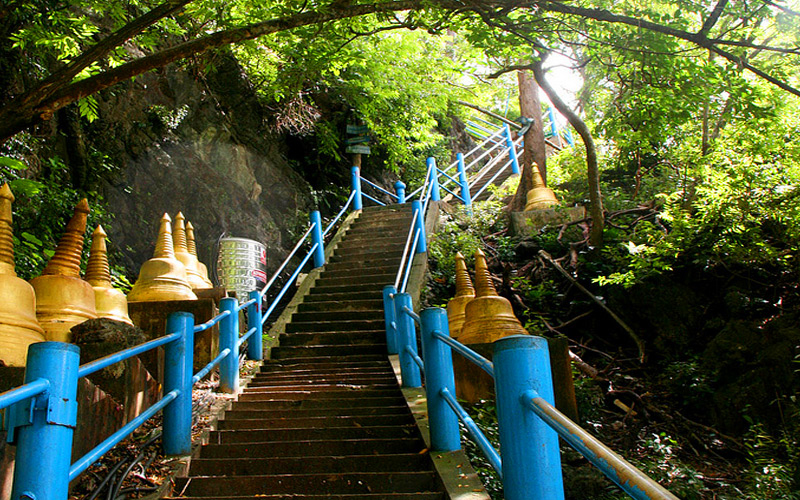 Wat Tham Sua ( Tiger Cave Temple) or "Tiger Cave" is located about 3 kilometres from Krabi Town. Inside the cave there are what appear to be tiger paw prints in the stone. The surrounding area is covered with large trees hundreds of years old, particularly in the Khiriwong Valley. Mountains are on all sides and there are smallers caves in great number. Aside from being the site of a meditation center, it is also a places of archaeological and historical interest. Stone tools, pottery remains, and the mold for making Buddha footprints have been found in excavations. 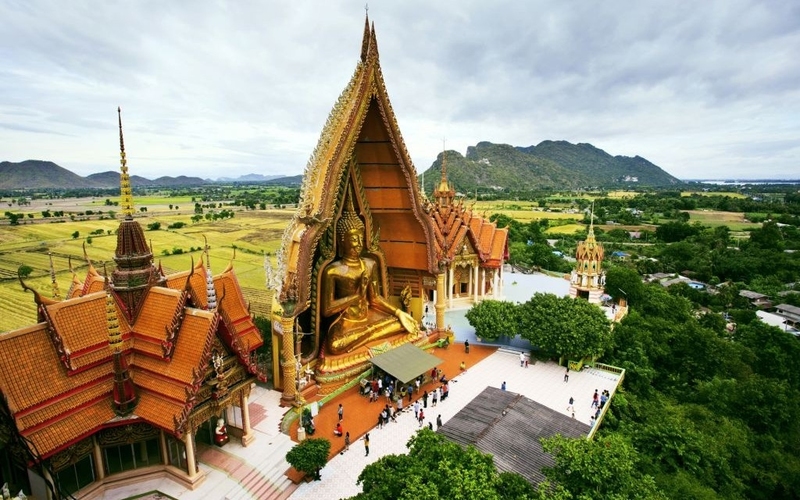 Tiger Cave temple, also known as Wat Tham Sua, is located near Krabi Town in southern Thailand. It is one of the more interesting temple complexes in southern Thailand, as the monks live and worship within a maze of natural caves in an overgrown jungle valley. 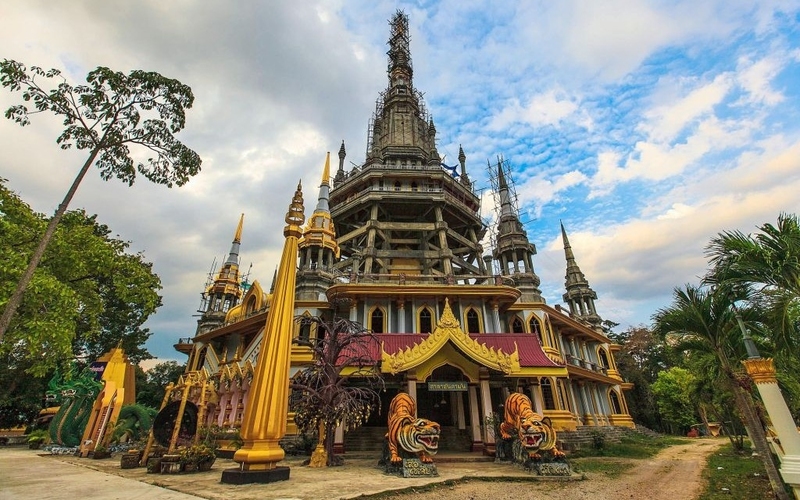 Wat Tham Sua teaches a form of Buddhism called Vipassana (insight meditation), which is based on the teachings of the earliest Buddhist texts. In the main temple cave you will find bizarre photos of internal organs and split cadavers, which are supposed to reinforce the temporary nature of the body and help the monks to focus on more spiritual matters. The main tourist attraction in the temple complex is the 1,272 step climb up a limestone tower to see the "footprint of the Buddha". Even if you are in good shape, the heat and humidity make this a difficult hike. Once you make it to the top, you are rewarded with stunning 360? views of the surrounding countryside and the Andaman Sea.